Drayage (also known as material handling) is an expense that is unavoidable and often blindsides exhibitors. 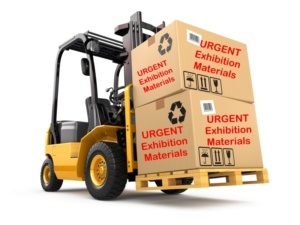 Drayage refers to the movement of your exhibition materials from the delivery vehicle to your booth space. This service includes: unloading the freight once it has arrived at the receiving dock, transporting the goods to your stand / booth, removing empty shipping items (such as crates and pallets) from your stand / booth space, temporarily storing empty shipping items during the show, returning empty shipping items once the show is over, transferring the freight back to the loading dock, and loading the items onto the vehicle picking up. A drayage contractor is appointed by a show organiser and we do not have any control over the service or the cost. How are Drayage Charges Calculated? Drayage fees are based on CWTs or weight per 100 pounds. In the US, basic drayage rates can range between $60 per CWT to about $160 per CWT. The basic drayage rate is used for freight that meets the following requirements: it is not fragile, it does not have any special handling instructions, it can be moved easily by a forklift (in other words, it’s on a pallet or crate), it arrives at the correct time, and it can be taken directly to your stand / booth space. All freight items that do not meet these requirements are usually billed at a higher rate. 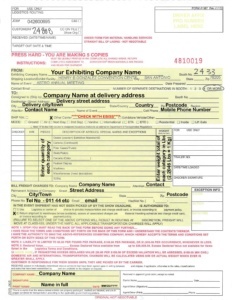 In addition, most trade shows process each loose item separately and have special handling charges. This means that if you are not careful in the way you pack your items, your drayage fees can be raised significantly. As the docks at the venues are controlled by the drayage contractor, EBISS is unable to come to you stand/booth to pick-up. What you must do at the end of the event is complete a bill of lading (also referred to as a material handling agreement) from the service desk of the drayage contractor. When you have packed, you must complete this form and take it back to the service centre when they’ll check the form and give you a copy. Without this form being completed, our truck will not be loaded and instead, they will use whatever methods at whatever cost to return your shipment to you and simply charge it to your credit card. You may incur further costs such as import VAT as the shipment will not be controlled correctly. We have created an example of a bill of lading / material handling agreement so you know what is expected. You can view it here or download it. 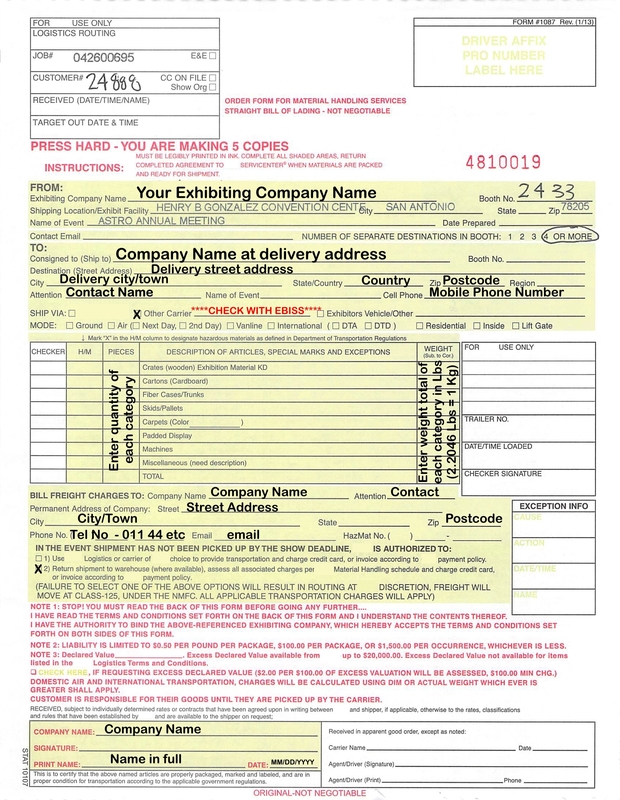 We do recommend though that you check all of the details with us before completing the form.